We were challenged to use an ad to create a LO. I ended up using the cover page from an article in a magazine. The colors (purple! 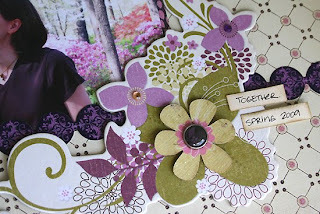 ), the circle shapes and the flowers caught my eye and really inspired me to create this LO! 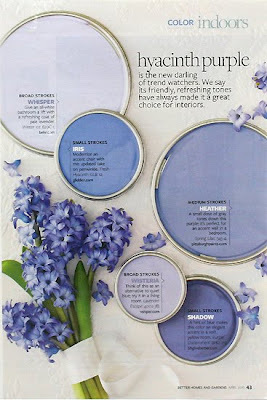 I flipped the placement of the circles and use the chipboard flowers in place of the hyacinths! Thanks for stopping by and make sure you stop by the Bo Bunny blog to see how the other designers used ad's to inspire them! Who knows, you might just find the inspiration you been looking for for your next LO! Very pretty, I love that paper, will have to check it out. Have a great week-end! 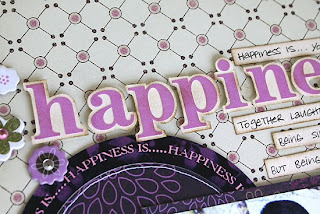 Julianna this is just gorgeous - I'm a huge purple fan and this is awesome! Fabulous design! So gorgeous, juliana! Big congrats on all your newest DT gigs - i'm sooo happy for you, girl! So well deserved!! Juliana, this looks gorgeous, love the Ad take, I am such a sucker for purple lol !! Gorgeous page, Juliana! I am usually pretty challenged by purple, but I am loving how you used it here. You make it look so easy and so, so beautiful! Oh my! This is soooo wonderful!!! You totally rocked this line. LOVE it .. you rock it girl .. loving this ..
Today is a good day!! !